I am surprised that I can’t find the Smoky (or anything like it) in my older cocktail manuals. The earliest listing in my library is from Sally Ann Berk’s 1997 Martini Book ; Dale DeGroff also lists it in his 2002 Craft of the Cocktail . It’s not credible to me that no one made this drink before the late ’90s; I suspect it has been around much longer than that, perhaps invented and almost certainly misnamed during the martini exuberance of the 1980s. The dryness of the Smoky makes it an excellent before–dinner cocktail; it pairs nicely with many hors d’oeuvres like smoked fish and cheeses. Stir with ice until well chilled, strain into a chilled cocktail glass; express and garnish with lemon twist. This drink works with either gin or vodka as the base; the gin’s effect is more pronounced with lighter whiskies. The gin version is more complex, of course, than the lighter and cleaner tasting vodka version. I had deep misgivings about that gin–and–whisky combination until I tried it; I was delighted to find how well it works in this drink. Rinse a chilled cocktail glass with Irish whiskey. Combine vodka and vermouth in a cocktail shaker with cracked ice and [stir] well. Strain into cocktail glass and garnish with lemon twist. “Smoky Martini Cocktail” at cold-glass.com : All text and photos © 2010 Douglas M. Ford. All rights reserved. Are there seriously no comments to this old post? Anyway, I thought you’d like to know that CocktailDB calls this the Chicago Martini. I’ve been making them occasionally, and I really enjoy them. So anyway: Interesting that CocktailDB shows no “Smoky Martini” at all. 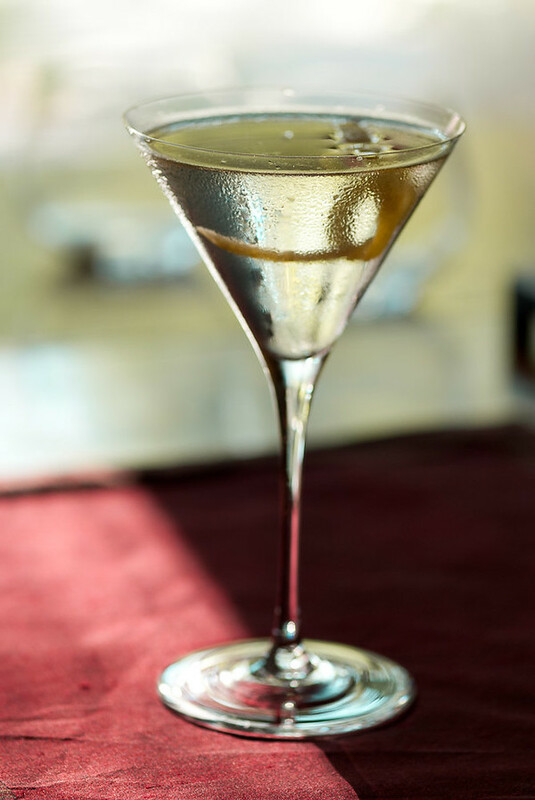 In addition to the “Chicago Martini,” it does show the “Dusty Martini”—similar, but very light on the Scotch. “Chicago Martini” is a great name, I like it. I’ll go with that. And add it to the tags. Hey, I’ll chime in! I actually really like the name Smoky Martini, but think it should be specified to use only a smoky scotch like Teachers, Johnny Black, or an Islay malt as you’ve mentioned! For some reason I feel like a “Chicago Martini” should feature grape brandy or cognac instead of whisky. Interestingly, I’ve subbed in a splash of Scotch(or Irish) for the usual lime in G&T’s with exceptional results. Don’t even know where to start with naming that one! “Scotch and Tonic,” I guess. Interesting idea, the Chicago Martini. Thanks for commenting. so all this makes me want to try something with a bourbon wash, or is that already “a thing”? Good question, I don’t know if a bourbon wash is already “a thing” or not. Anyway, I’d say give it a try. Thanks for the idea. Ungava Bay gin: I have never encountered it. One place I particularly enjoy Carpano Antica is in the Saratoga, which is very much in the Manhattan model, with half the rye whiskey replaced by brandy. Carpano’s lushness seems just the thing there. Carpano also works well in the Negroni, and particularly in the Negroni’s apple brandy cousin, the Normandie. Good question—thanks for taking time to comment. Ungava gin is a Canadian gin, relatively new, made only with ingredients grown in Canada. The previous commenter didn’t mention it specifically, but it has an interesting bright yellow color. It is a decent gin, as New World gins go. Give me Philadelphia Blue any day. Also, as someone who loves peat more than anything else in the wide world of liquor, I absolutely support your brother’s recipe. My only change would be to specify more exactly the 10 Year Laphroaig (or if you’re feeling decadent and a bit debauched, Ardbeg Supernova), and Monopolowa Vodka for a more crisp support of the whiskey. For those wanting to ease into smoky whiskies, and not sure if they’ll like, try the Irish Connemara or Suntory Hakushu 12 Year Old for whiskies that have a wisp of smoke, and are still excellent if you don’t end up loving it. They also shine in Old Fashioneds made with a tiny bit of orange liqueur to sand off the peat. I still haven’t encountered the Ungava gin in my region; I’ve seen a couple reviews that made it sound intriguing, though I’m a dyed-in-the-wool London Dry guy. I look forward to tasting it someday. I’m with you on the Laphroaig and Ardbeg as smoke and peat sources. I’ve never had the Supernova, I’ll have to work on that. The Monopolowa vodka is an interesting suggestion. I’ve not seen it in my liquor stores, but I’ll be watching — I like the idea of something “crisp” to stand against the whiskies. And sorry for overpowering, but on the subject of whisky “rinses,” Phil Ward of Mayahuel and Death and Co. has invented an excellent Sazerac-inspired drink called a Cooper Union with a Laphroaig rinse, Redbreast Irish Whiskey base, St. Germain, and orange bitters. If there’s one thing Death and Co. taught me, it’s how much peaty Scotch loves citrus.